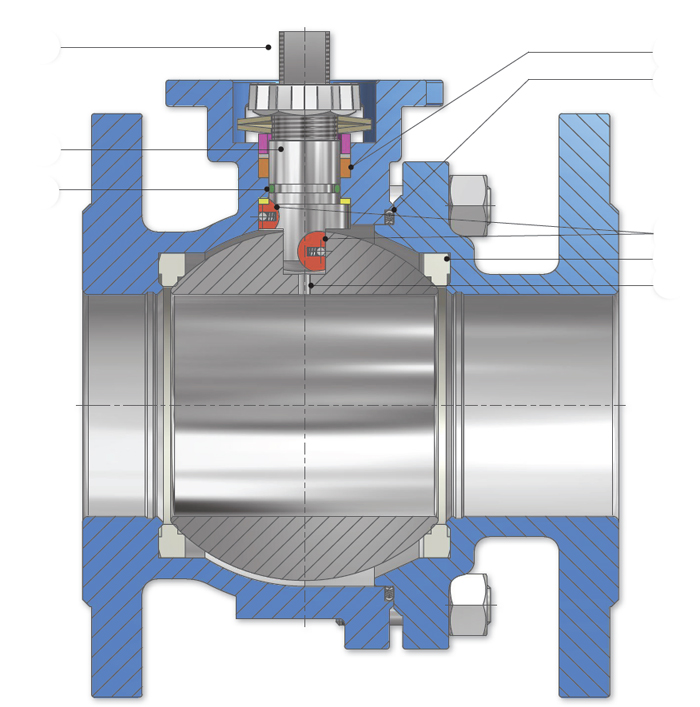 Ball Valves take a leading role in the valve industry. The scope of applications is enormous, because of the quarter turn construction they are easy to operate and require almost no maintenance. Moreover full bore Ball Valves are ideal for conditions which require maximum flow capacity with minimum pressure drop. The Ball Valves are of a two piece construction and have a solid full bore ball. Relevant design standards are EN ISO 17292, EN 12516, ASME B16.34 and API 608. Carbon steel (1.0619/ASTM A216 WCB) and stainless steel (1.4408/ASTM A351 CF8M) are the materials which form the standard supply. Other materials can be supplied upon request. The Ball Valves are fire-safe certified according to API 607 6th Edition and ISO 10497. In the event of fire, a secondary metal lic seat prevents leakage through the valve port. A graphoil stem seal and a Leader® graphite spiral wound body gasket with PTFE inner layer ensures tightness through the stem packing and body joints. Two Belleville spring washers ensure optimal sealing performance, also compensating for changing process conditions. Advantages of this feature are an increased operational safety and less maintenance. In accordance with fire-safe requirements, the packing material is made of Graphoil. In order to comply with the very strict emission requirements for TA-Luft certification, a Viton® O-ring has been placed. The ball-stem connection and the stem-body connection have an anti -static feature, which ensures electrical continuity between those parts. As a result the Ball Valves comply with ATEX guidance 94/9/EC (Ex II 2 G-D Ec-c II) for potentially explosive environments. A Direct Mount top-flange according to ISO 5211 is standard for these Ball Valves. This feature makes it possible to mount an actuator without the need of a mounting bracket and drive adapter. This gives a considerable cost reduction, compact automated unit and a higher level of safety for operators. The highly polished solid ball has a pressure relief hole in the stem slot in order to avoid pressure build-up in the body cavity. This ensures a tight shutoff and long service life. The valve stem assembly has a blow-out proof construction and a square top connection. A PTFE thrust washer seal helps to achieve a low operating torque. Because of the double stem seal construction utilizing an O-ring and a spring loaded gland packing the flanged Ball Valves comply with very strict emission requirements. In this respect they are certified by TA-Luft (VDI 2440, Section 3.3.1.3). A flexible seat design provides tight shut-off at high and low pressures. The special seat construction limits wear to a minimum and ensures low torque values under all operating conditions. Standard seat material is a high grade PTFE TFM1600. Besides the proven mechanical and chemical properties of PTFE, this chemical reinforced version offers suitability for a wider range of applications in respect to pressure and temperature. The Ball Valves are 100% tight and are tested in accordance with API 598 (ASME) or EN 12266 (DIN). SIL is an international standard (IEC 61508) and is short for “Safety Integrity Level”. Econ® ball valves are suitable for SIL 2 applications. The DIN Ball Valves are supplied with a face to face dimension in accordance with EN 558, 27 and ASME Valves in accordance with B16.10 long pattern. The flanges are in accordance with EN 1092-1 (DIN version) or ASME B16.5 RF (ASME version). Flange facings have a surface finish of Ra 3.2 – 6.3. All stainless steel Econ® Ball Valves comply with NACE MR0175 as a standard. On request also the steel version can be supplied according to NACE specifications. Castings have a high quality finish (minimum MSS SP112, level 2). Carbon steel Ball Valves have a primer and blue top coat (RAL 5015). Total paint thickness is 60-80 µm. The Ball Valves as standard are supplied with a SS304 handlever (DN15 – DN80) or a T-bar (DN100 – DN150). For DN200 a gearbox can be supplied. All handlevers are lockable in open and closed position. Where extra security is required a padlock should be fitted to lock the valve in the open or closed position. As an option a heavy duty lever can be supplied for the DN15-DN80 valves. All Econ® flanged Ball Valves can be supplied with a EN 10204-3.1 test- and material certificate.